This animation of Comet 67P/Churyumov-Gerasimenko uses a three-dimensional digital model of the comet nucleus, which was produced by the DLR Institute of Planetary Research in Berlin using stereo photogrammetry. It represents the comet's surface with a resolution of two metres. For the computation of the model, about 180 images were acquired by the OSIRIS narrow-angle camera (OSIRIS-NAC) between 5 August and 3 September 2014. The landing trajectory corresponds with plans made by ESA. The approximately seven-hour-long manoeuvre is shown accelerated in time. The methods employed were developed in the Departments of Planetary Geodesy and Planetary Geology at the DLR Institute of Planetary Research and have been used successfully for over 20 years on planetary missions. For Rosetta, they were adapted and expanded for the specific conditions of a comet mission. Credit: Animation: DLR; Dates: ESA/Rosetta/MPS for OSIRIS Team MPS/UPD/LAM/IAA/SSO/INTA/UPM/DASP/IDA. The German Aerospace Center (DLR) Lander Control Center (LCC) is responsible for the operation and commanding the Philae lander. The Philae lander on board the Rosetta spacecraft has been en route to its destination, Comet 67P/Churyumov-Gerasimenko, since 2 March 2004. On 12 November 2014, it will be released from its mother craft at an altitude of 22.5 kilometres above the comet and – if everything goes according to plan – will touch down on the surface of the comet about seven hours later. 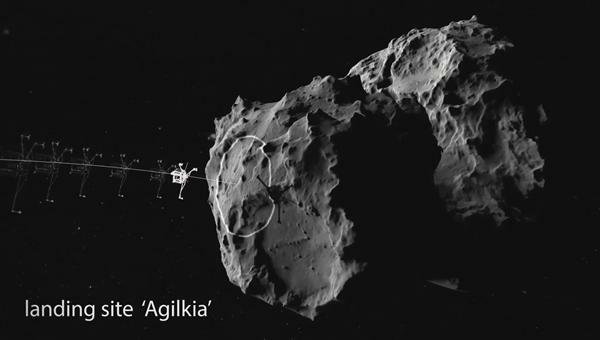 A cold gas thruster will push the lander onto the surface and harpoons will ensure that Philae is anchored there. The signal indicating a successful touchdown is expected to reach the German Aerospace Center (Deutsches Zentrum für Luft- und Raumfahrt; DLR) Lander Control Center (LCC), from where Philae is monitored and controlled, at around 17:00 CET. The LCC's tasks also include programming the landing sequence, from separation from the Rosetta orbiter to the landing on the comet. The commands for Philae and the 10 instruments on board will be sent from the Control Center in Cologne to the European Space Operations Centre (ESOC) in Darmstadt, and from there via ground stations to Rosetta and Philae. The telemetry from Philae will travel in the opposite direction via ESOC to the LCC. In this interview, Stephan Ulamec explains the process and risks for this first ever landing on a comet. The interview was conducted by Manuela Braun. Philae is due to touch down on 67P/Churyumov-Gerasimenko on 12 November 2014. When is the last time contact can be made with the lander before the landing process is initiated? 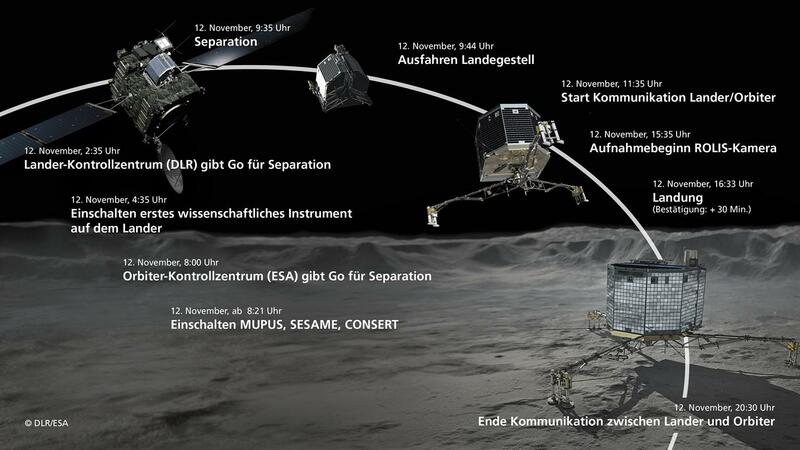 The sequence that controls the landing was sent via the orbiter and on to Philae on Saturday 8 November. The lander will be switched on and heated up on the following Monday. In the meantime, we will remain in almost continuous contact with the lander. There will only be brief interruptions in the connection when we switch from one ground station to the next. What might cause the initiation of the landing to be delayed or cancelled? We will of course have to check that the commands for the lander have actually reached the orbiter and are in what are called the Stored Telecommand Buffers (STCBs), which is where the command sequences are stored. The separation might also be delayed if subsystems such as the batteries on the lander are not functioning or if the flywheel does not spin up. When do you reach the point of no return for initiating the landing? As regards the lander, we will give our final 'go' seven hours prior to separation. Two hours before separation, ESA will check whether Rosetta's orbit is correct and that the final orbital manoeuvres have been performed correctly. The command sequences for the lander are already there, but they can still be stopped if we find out, for example, that Rosetta is in an incorrect orbit and that this might endangers Philae's landing. The process will then be stopped and nothing will happen. Rosetta will then simply fly on, go into a higher orbit and we would probably make another attempt in two weeks. When on 12 November will the team in the Lander Control Center receive the initial feedback from Philae? We will start receiving data during the descent – the connection will begin around two hours after separation. At that point, the lander will start sending data to the orbiter, and from there back to Earth. This will be information on the status of Philae – referred to as 'housekeeping' data – and some science data. For example, we will receive information as to whether the landing gear has deployed. We will also receive images of the descent from the ROLIS camera and data from the CONSERT instrument. We will also receive data immediately after the landing – immediately meaning with a signal delay time of 28 minutes, as ever. This is how long it takes for the signal to reach us in the Control Center. The touchdown is scheduled for 16:34 CET, so the data should come in at 17:02 CET. But it may not be that precise. We have a landing ellipse with a diameter of one kilometre, meaning that the location of the landing is imprecise – so the timing is a little imprecise – it might be a little earlier or later. What tasks do the team in the DLR Lander Control Center have to perform during the landing? There are several decision criteria for or against initiating the separation, for which we need to check and analyse the data from the lander. This happens in the Lander Control Center in Cologne. If one of the values deviates from the nominal values, this will be something of a problem. We will have to see if it is a transmission error, if a sensor has delivered incorrect data or if a system somewhere is not functioning correctly. In this case we will have to decide if this can be corrected by sending a new command or if the landing process will have to be aborted. What options are there for intervening during the descent? In the worst case, we can still send commands to the lander even after separation. We have already carried out simulations of this. In doing so, we have assumed that Philae has not received the separation signal from the orbiter. Then, it descends for seven hours, not knowing that it has separated, and so the landing gear would not have deployed. That was instructive. Here in the LCC, we have generated commands to tell Philae that it still needs to deploy the landing gear and switch to touchdown mode and that the harpoons need to be prepared. This has worked well in the simulation. Of course, this is not the plan, but that is what would happen in an emergency. So, we can use the five hours prior to the landing when we are in contact with Philae for corrective commands. And in which case would the LCC have to just sit and wait, unable to correct anything? One thing we cannot do at all is carry out trajectory corrections during the descent onto the comet – this because Philae has no manoeuvring capability. There will be no real-time video showing the landing in the LCC. How will the team know that Philae has landed? We will receive the touchdown signal as part of the lander data; this triggers the harpoons on Philae and activates the cold gas thruster on the upper side of the lander. This touchdown signal is itself triggered when the central element of the landing gear is pushed upwards by the touchdown and the contact pressure. At that point the lander will know that the harpoons have to be fired, and the ROLIS camera can be switched off. We in turn will know that Philae has landed on the surface of the comet. The signals will then be analysed in detail for the first time. Have the harpoons been fired, and have they been retracted to anchor the lander to the surface? The images from the panoramic camera will be received relatively quickly, and we will see the landscape and perhaps even the horizon of the comet. At that point everything will be looking good and the next science phase can begin. What might jeopardise such a flawless landing? I see the biggest risk in the landing itself. We have a relatively large landing ellipse of around one square kilometre. It is true that there is a lot of flat terrain in the region – that is why it was chosen – but there is also a certain percentage of the region where there are steep slopes or a number of boulders. If we are unlucky and one of the legs lands right on a boulder or a slope, the lander might tip over. If the slope is inclined at significantly more than 30 degrees, it is even likely that Philae will roll off. It is hard to predict what would happen then. If it comes to rest with its legs upwards and the antenna underneath, we would be unable to communicate with it. That would be the end of the lander mission. If it ends up on its side, we would try to carry on receiving the signals and might then be able to rescue some of the science. If it is on the surface but is not anchored down, we would not initially deploy the SD² borer and the MUPUS probe. Doing so would most likely lift the lander off the surface and turn it over. But the cameras, radar instrument, mass spectrometer (in 'sniffer' mode) and the magnetometer could still be operated. There is an extreme case where Philae misses the comet and flies by it. But I consider the likelihood of that to be very small. The orbiter would then have to be in the wrong attitude or position right at the moment of separation. What happens first after a successful landing? The First Science Sequence will start. When we know how and above all where exactly we have landed, we will very quickly run an analysis of what illumination there actually is. We have calculated typical illumination scenarios for this landing area, but ultimately it depends on whether Philae is on a sunny slope or in shade behind a boulder. This is important for the following scientific phases, where the lander's batteries will be charged by solar energy. The First Science Sequence, in which all of the instruments are put into operation, can also still be modified, because we know when the Sun will rise and set and when there are possibilities for communication via the orbiter to the lander and back to Earth again. What happens during the first night shift in the LCC, when the lander has no radio connection with Earth? There will have to be frenetic work in the LCC during the few hours until next contact, analysing all the data and images so that we know the precise condition of the lander. For example, how is the lander orientated on the comet? How secure is it? Then we must decide how dangerous it is to start boring, or whether an instrument needs its settings changed to be able to work properly. The scientists on site in the LCC will also be consulted on this. What will happen to Philae as the comet continues to approach the Sun? In terms of thermal design, the lander is equipped to carry on functioning until it is a distance of two Astronomical Units from the Sun, or around 300 million kilometres. This point will be reached in late March 2015. At that point the lander might overheat and be unable to continue operating. But it might also be that a lot of dust falls back onto the surface of the comet and covers the solar panels in doing so. That would mean that Philae will not receive sufficient power to be able to function. The entire mission, from planning to the landing, has now been running for about 20 years. Is the excitement among the team rising so soon before the landing? Of course. We have done all we can to make the landing successful. But whether we land on a slope or in a flat area is down to chance – we cannot do anything about that. We have done our best to select a good landing site that is relatively safe. Now we just have to see if it works out. Rosetta is a European Space Agency mission with contributions from its Member States and NASA. Rosetta's Philae lander has been contributed by a consortium led by DLR, the Max Planck Institute for Solar System Research (Max-Planck-Institut für Sonnensystemforschung; MPS), the French space agency, CNES (Centre National d'Études Spatiales), and the Italian space agency, ASI (Agenzia Spaziale Italiana). More videos about the Rosetta mission can be found here.